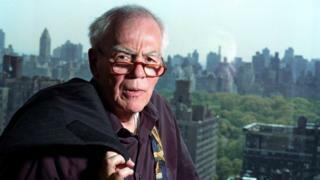 Jimmy Breslin, the journalist who spent decades chronicling New York City life, has died at home in Manhattan aged 88. He died of complications from pneumonia. The Pulitzer Prize-winning writer's career included interviewing John Kennedy's gravedigger, exchanging letters with serial killer Son of Sam and documenting the dwindling hope for survivors in the wreckage of 9/11. The New York Daily News described him as a "scoop machine". Breslin was working for the Daily News the day he received a letter from Son of Sam, the killer who stalked the streets of New York in 1976-77. "Hello from the gutters of N.Y.C. which are filled with dog manure, vomit, stale wine, urine and blood," it read, leading one colleague to note the killer was "a pretty good writer", Breslin later revealed in his column. This was far from his first scoop, however. The self-described "street reporter" had made his name in 1963, interviewing "one of the last to serve John Fitzgerald Kennedy" for the New York Herald Times: a 42-year-old gravedigger named Clifton Pollard. "Clifton Pollard was pretty sure he was going to be working on Sunday," began the column which would go on to be a revered piece of journalism. He later shrugged it off to the New York Times. "I went there automatic," he told the newspaper. Breslin was known for taking on authority - whether it be the city council, or the mafia - and writing about the city's underdogs, small-timers and victims, capturing them all with his sharp eye for detail and keen ear for dialogue. His method was simple, he told CNN in 2013: "Keep your mouth shut and your eyes open and keep moving." Unfortunately, he was not moving fast enough in 1991, when he visited the racially tense Brooklyn to cover a speech. His taxi was surrounded by a mob of black youths shouting: "White man! White man!" They stole his cash and credit cards - and left him standing in his underwear. But minor setbacks like this did nothing to dent his confidence.